Do you guys know how pretentious you sound? The page I linked above is a discussion on picking the right water for your meal. Did you know there are professional Water Sommeliers? Seems like there are many people who enjoy high quality H2O. Bobby Boucher would be proud. Now don’t get me wrong. Water taste different. I know this as a fact. Poland Springs does not taste like Evian, which my father was once quoted as being, “Fresh from the French Apes”. Fiji does not take like the very obscene sounding Volvic. I just don't need someone to tell me so. Yes, I have my preferences. I prefer Fiji but honestly, I’m not picky and I’m certainly not choosing waters based on my meal. The day I have a conversation with someone about how Deer Park doesn’t cleanse the palate after a plate of duck confit as Dasani does is the day my husband divorces me. 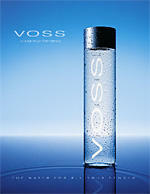 I found this site because I recently received a bottle of Voss water as a present from a friend. It’s a long story that really isn’t worth the words it would take to tell it. I wanted to know what their pitch was and boy was it a doozy. I’m going to save you the painstaking task of going to Voss’ website and going through all the Flash pages to get to the description. I have no idea what a virgin aquifer is but I kind of feel bad that I’ve deflowered whatever it is for my 800mL of H2O. Don’t get me wrong, it tastes great. It’s light and airy. If a water can be light, this is it. Plus, the glass cylindrical bottle is really cute in a sci-fi, test tube kind of way but if it isn’t bad enough that I’m paying for H2O, I have to deal with water sommeliers? I get a headache reading the wine list at a restaurant. I couldn’t possibly imagine getting a water list.